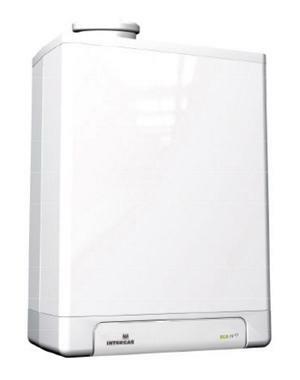 The Combi Compact ECO RF is a combi gas boiler by Intergas. As a Combi boiler it will supply hot water and heating on demand directly from the mains water supply. This means you don't need to have a bulky tank or cylinder making it perfect for smaller homes where space may be limited. This boiler has an efficiency rating of 88.8% and an output of 24kW. This means it is particularly well suited for smaller properties which do not have a high demand for hot water. This unit has been designed with unique high efficiency technology including a unique 2 in 1 heat exchanger, innovative control system, just 12 components and 4 moving parts. It ahs been awarded the best tested accolade for two years running and condenses 100% of the time to ensure you are saving as much energy as possible. This boiler can be wirelessly connected to the Honeywell wireless room thermostat which can be used to monitor your energy usage to achieve further savings on your bills. This boiler also includes 5 years warranty on parts and 10 years warranty on the heat exchanger, which should give you added security that you have purchased a highly reliable unit.